With two new high school facilities on the way, the Henrico County Public Schools (HCPS) system is set to get even better. The County’s longstanding reputation for first-rate education and array of career preparation options are key reasons why parents and businesses choose to locate in Henrico. Henrico’s reputation is affirmed at the national level, with four Henrico high schools named best in Virginia by U.S. News & World Report and the entire HCPS organization earning one of only five National School Boards Association’s 2017 Magna Awards for large U.S. school systems. In Virginia, Henrico stands out even more, with 24 schools earning the Virginia Index of Performance awards for advanced learning and achievement – a feat accomplished in part to Henrico having the most teachers certified by the National Board for Professional Teaching Standards in Central Virginia. Dr. Amy Cashwell, Henrico County Public Schools’ new superintendent and the first woman to ever hold the position, was sworn in to lead the system in July. Dr. Cashwell, formerly the chief academic officer for teaching and learning in Virginia Beach, is well equipped to oversee the next chapter in the system’s history. In 2016, the citizenry of Henrico County overwhelmingly passed a $272.6 million bond referendum to renovate and expand Henrico schools and libraries. This September, Cashwell and Henrico officials proudly announced a large portion of those funds would go to the renovation and expansion of both J.R. Tucker and Highland Springs high schools. Construction on the two schools will start in 2019, with an expected completion date of fall 2021. Henrico’s school system does more than educate young people, as new County programs and institutions are aimed toward career readiness for students. Henrico’s Career & Technical Education (CTE) program and institutions like Code RVA, Deep Run Center, and Highland Springs High Tech Academy provide technical training in partnership with the local business community. This September, the Henrico CTE Business Advisory Council (BAC) kicked off another year of collaboration between local industry leaders and Henrico’s CTE educators. The event, attended by more than 150 local companies and catered by Henrico culinary arts students, is a prime example of the County’s efforts to create a job-ready workforce pipeline to support local employers. President of Pixel Factory Data Center Scott Brown knows the special skills Henrico CTE students can bring to the table. He - along with nearby tech company Richweb - has hired interns from Deep Run Center for Information Technology to work in his data center for years. “They’re self-starters. When you seed them with information, they take it and expand upon it,” says Brown of the Pixel Factory’s Henrico interns. Recently, Brown asked the interns to build a software application to run inside a docker container like a cloud virtual machine. Just two days later, the students presented their solution, which has since been incorporated into the facility’s network monitoring software, helping manage data for the Pixel Factory’s fast-growing client base. Innovation can be found in Henrico’s private schools, as well. Twenty-eight preschools, 43 elementary schools, and 21 high schools make up the independent education offering in the county. This includes the acclaimed Collegiate School, St. Christopher’s, Grove Christian School, and The Steward School. 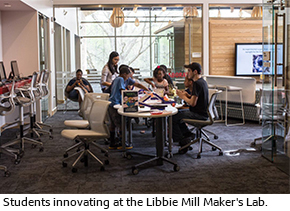 The latter is a “facility for the next generation of innovators,” where students enjoy an innovation lab, wellness studio, campus gardens, and much more. 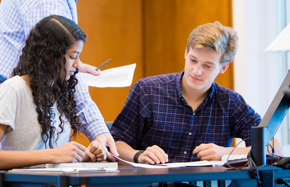 Whether it is a quality education for children, access to career-ready high school graduates, or being part of a community culture of success, Henrico County offers exceptional value and opportunity for its citizens and businesses. With a dynamic leader, new schools on the way, and a dedication to providing a superior future workforce, Henrico is making key investments in human capital that will pay dividends for years to come.